Turtles are among the oldest living reptiles and have not evolved greatly from their prehistoric ancestors. They appear to ‘fly’ through the water and spend most of their lives at sea, however the female comes to shore at night to lay her eggs. 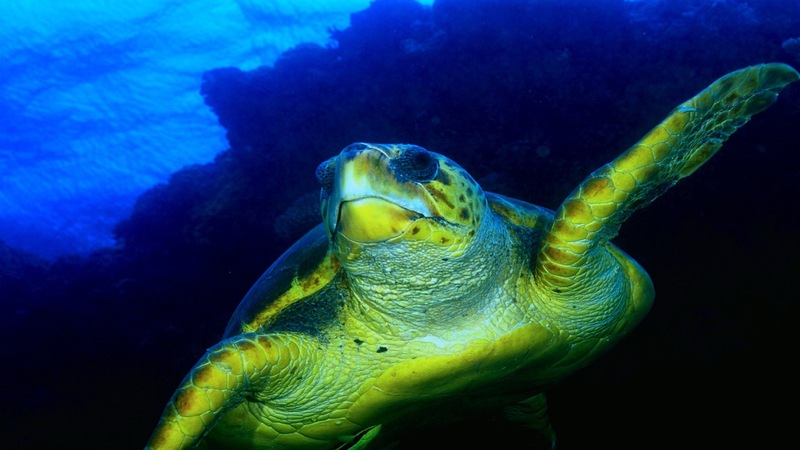 Once reaching maturity, at about 30 years old, turtles may swim thousands of kilometres to return to their breeding grounds and the place where they themselves were born, to carry out this incredible feat. All marine turtles are endangered for a number of reasons, their eggs are poached, their flesh and oil are eaten, their shells are used for jewellery, they are caught in fishing nets and drown and rubbish that drifts out to sea, such as plastic bags and bottles may choke them. However, one of the biggest problems is coastal developments along the coastline which disturb the nesting females and disorientate the hatchlings who navigate their way out to sea from shore with the help of the moon and stars. Above: Coral Cay segment from the film Coral Sea Dreaming showing Seabirds and Turtles nesting behaviour.